Hello to the official Michigan Ballroom Dance Team for Winter 2019!!! Our roster for the semester is now complete and I want to extend the warmest of welcomes to the newest members of the MBDT 🙂 I am so excited that you are joining our community and hope everyone had a fantastic Guys’ and Girls’ Night, whether it was your first time or last of many. I know I thoroughly enjoyed getting to know you all better, dancing with my fellow ladies and beating the guys in the dance off (in my totally unbiased opinion at least), and celebrating the start of a great semester together! Mandatory DTS intro session on Tuesday: Outside of lessons, our main team practice space is Dance Theatre Studio (aka DTS). We will be holding an intro session to show you how to use the space this Tuesday 2/12, 10-10.30pm. DTS is located at 713 North University, here’s a map to help you find your way, or if you come to the lesson beforehand someone will walk you over from the CCRB. If you can’t make the info session, please contact your lovely Practice Space Coordinator Corey (cgkflynn@umich.edu) to schedule a make up, or you will not be able to use DTS this semester. Also, please don’t show up to DTS outside the times listed in the schedule below as the studio will be full of many tiny children taking tap classes! 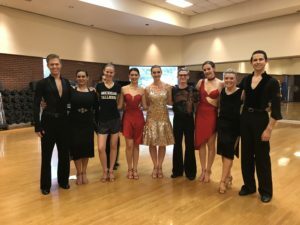 Vending: Team alumni Vincent and Daisy, owners of Ypsilanti dance store VE Dance, will be at DTS on Tuesday, 10pm-midnight, with a variety of Latin and standard shoes plus heel caps and a selection of other items from their store. If you’re interested in competing this semester this is the perfect opportunity to get kitted out for the competition floor! Galentine’s Day! Celebrate the amazing ladies in your life! 9-11pm: Supervised Practice in CCRB 3275! Come and practice all the dances you’ve learned so far with the help of experienced team members, who will be available to answer all your questions! Open to newcomers and Pre-C, you can either bring a partner with you or find one at the practice. Enjoy some discounted V-Day chocolates! Club are having a Valentine’s Day party this week, check out the event page here for more info. Club is in the League Ballroom this week, you can find more details on their website here. March 2nd-3rd: Arnold! Our biggest competition of the winter semester is less than a month away! 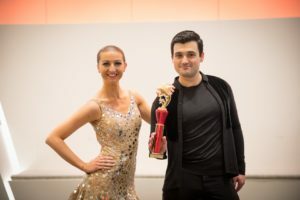 The Arnold Youth Dancesport Classic is on the first Saturday and Sunday of spring break, and you don’t want to miss it! The points we earn from Arnold contribute towards our score at next year’s nationals, thus making it essential for defending our title for the fifteenth consecutive year. Be sure to save the date so you can dance for the Terminator himself, who makes an appearance every year in the ballroom!!! March 23rd: MichComp! Your amazing Home Comp Chair Anna has been hard at work preparing our team’s very own competition. Our home competition at Pioneer High School is the perfect opportunity for your friends and family to watch you dance! March 29th: Dance Mix! It’s your favorite spectacular end of year dance show, and our formation team will be performing again this year! 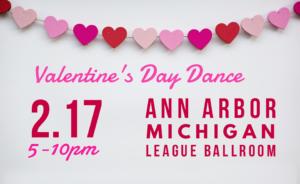 Last year’s show was sold out with thousands of people filling the Power Center, so don’t miss out on an evening of performances from UofM’s best dance groups.